“The Knight of the Burning Pestle” was written by the accomplished Jacobean playwright Francis Beaumont and first performed around 1607. In the play, the audience interrupts the (apparently rather dull) Elizabethan drama “The London Gentleman” and insist the players perform a different play (made up on the spot) starring the Citizen’s apprentice Rafe as “The Knight of the Burning Pestle”. The players themselves stumble on, alternately trying to get through “Gentleman” while periodically returning to the adventures of “The Knight”. The first parody written in the English language, and perhaps the first modern play, it has been more and more frequently revived in the 21st century, as the antics of the “audience” and the consternation of “the players” tickle the funny bones of modern audiences just as much or more as they tickled the courts of King James and King Charles. The production will be infused with music and directed by newly minted U.C. Berkeley theatre graduate Lelan Fernando, fresh off directing a number of works at Cal during his senior year, with stage management by Tessa Maurer. Lelan will be assisted by Michael R. Cohen, who directed our first foray at John Hinkel Park, “Fortinbras” back in 2013. Featuring Actors Ensemble veterans Marsha van Broek as the Wife/Nell, Lee Vogt as The Citizen/George, Polina Litvak as Humphrey, Susannah Wood as Mistress Merrythought, Bruce Kaplan as Merrythought, and Peter Weiss as The Merchant, with newcomers Alexander Espinosa Pieb as Rafe, Shannon Maudlin as Michael, and Kax Valtchev as Jasper. Set design by Elena Childs, fresh off assisting with Chalk Circle, with costume design by Marie Morely. Productions are free-of-charge, no reservation necessary. 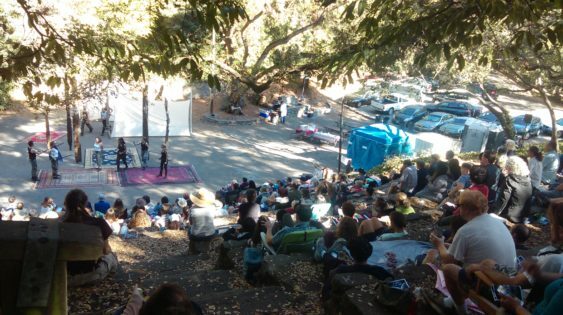 The amphitheatre consists of wide stone steps; blankets and/or low lawn chairs are recommended. The performance will last 1 1/2 hours, including a 15 minute intermission, with hot dogs and corn-on-the-cob on offer. The venue is wheelchair accessible.